You need to have a website, Jean. I wonder how many times I heard that before I actually did something about it. It wasn’t that I didn’t want a website. The reality was that I just didn’t know where to begin. The whole thing seemed so daunting and costly that I chose instead to become Cleopatra, Queen of D’Nile. "Why have a website? I think every artist needs at least a one-page website, the same as they should have business cards and postcards." I finally put together a website that works for me. It’s not the shimmering portal of artistic perfection I’d originally envisioned, but it works great as a communication tool, which is what I need most at this point in my beading career. That was my first lesson about websites: The best thing about them is they are truly “living” documents that can be altered and expanded as your needs change. The best way to know what you want on your site is to look at other sites, so surf, surf, surf. 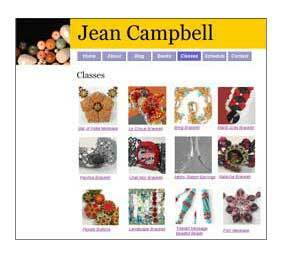 Research beading websites, but also check out other craft sites. What attracts you? What turns you off? How do you navigate from page to page? Take notes, make sketches, and do thinking maps. Then narrow your search to websites that are similar to the one you envision for yourself. Bookmark these pages for future reference. Next, do some research on website hosts. What services are offered? How much is the fee? Will you be able to design your own site? What do the templates look like? Is there a shopping cart option? Don’t be like me, the victim of extreme expectations paired with a severe case of Ahsdragen disease, and wait for months or never publish a website at all because you want it to be perfect and fabulous the first time out. Even a simple page with your name, contact information, and a few examples of your work is better than nothing at all. Just get something up and then continue to work with the site like clay—molding it, adding to it, changing it, interacting with it. If you’re designing your own site from scratch, simplicity is key. The best sites I’ve seen from individual beaders are clean and crisp. Their navigation bar has only a handful of items and there isn’t a bunch of distracting borders or small, busy type. The photography is clear, on white or plain-colored background without too many props. I’ve tried to keep all those things in mind as I designed my site. 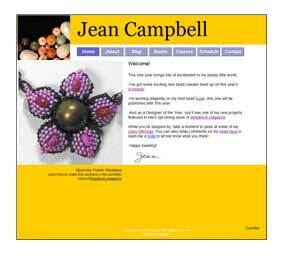 Remember that you have a maximum of about 3 seconds to get your viewers’ attention, so make sure your most enticing beadwork is on your homepage. Give the viewer a reason to stick around and explore your site by offering plenty of visuals and text on subsequent pages. 4) Don’t Stress about the Design. If you’re technologically and/or graphic design-challenged and aren’t up for designing your site from the ground up, take advantage of your web service provider’s many free templates. Most offer enough styles that you’ll find one you like, and many give very easy-to-follow suggestions on what type of information to put on which pages. If you find you’re overwhelmed by the idea of getting a website going on your own, there are lots of web design services available. This is, of course, a more costly way to go, but for some people it’s worth it .One of the best ways to find this kind of service is to contact a site you really like that’s been designed by someone else. (Most web designers have their name at the bottom of the websites they’ve designed.) Once you contact the designer, ask lots of questions to find out what services they offer, such as site design, ongoing maintenance, shopping cart set up, etc. Be sure to get quotes and, most importantly, several references. If you want people to keep coming back to your site, be sure to give them a reason. Keep your product updated and make sure all the dates and photos are current. You may even want to start a blog to share tips, events, and news. Do you have more tips on getting your website up and running? Share them with everyone on Beading Daily! 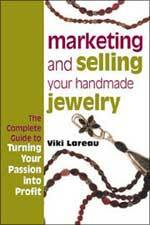 Are You the Next Bead Star?